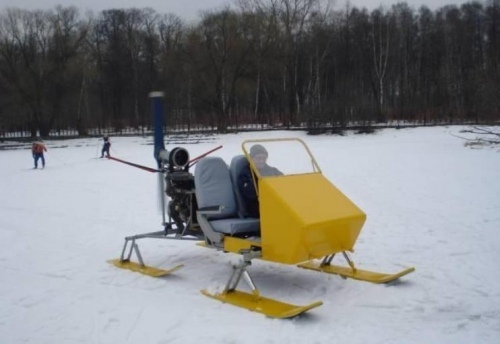 In the Northern regions of Russia in winter the only means of transportation is snowmobile. But not everyone can buy a signature model, and to separate categories of citizens required custom design. And that, in either case, the solution is to make the snowmobile with his hands. First complete a sketch of the planned design of the snowmobile. This will provide two components of the device: led and lead. The first should consist of the skids, the steering column and shock absorbers. The second part should contain the power plant, the frame, the drive and the driver's seat. However, if necessary, can change the design, adapting it more to fulfill the expected tasks. 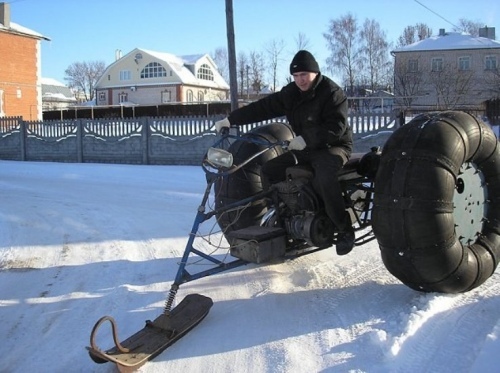 Define parts and assemblies of the snowmobile, which you will not be able to do it yourself. You can buy them and roughly estimate the location of the units on a snowmobile, the dimensions of the structure and its individual parts. 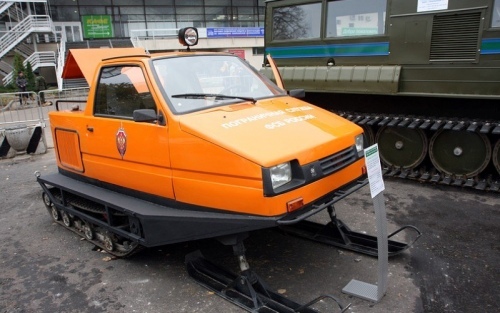 Approaching the layout professionally manufacture Plaz – the layout of a snowmobile in a life-size plywood or cardboard. Make models of all purchased parts, frame layout and the use of this plasma. After you determine size and arrangement of parts, which are supposed to make yourself. Independent fabrication frame necessarily implies bending, welding equipment and relevant skills. If all this is not to order the production of frames to the nearest workshop at a pre-drawn drawing. To do the frame myself start by selecting the required tubes. Pipe, taken from motorcycle frames prefer water. Special frame tube, tend to be more durable. Bend the pipe on the bending as necessary. Before welding assemble the frame, joining parts by spot welding. Perform a preliminary adjustment of elements of the frame and attached thereto parts of a snowmobile. This will allow to avoid mistakes in the design. Final welding spend a single seam, preferably without discontinuities and other flaws. Weld the mounting brackets of the engine, skids, wheel drive, seat, steering column and other parts. The skids are manufactured in two broad skis. Weld the steering column and secure it to the rails with staples, swivel. A more complex option involves the use of shock absorbers in the suspension of the skis. 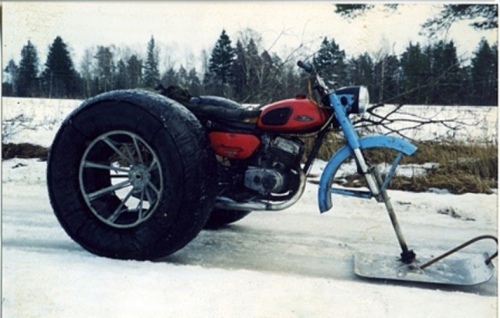 If the design of the snowmobile provides a wide-set front skis, the shock absorbers are more suitable lever from a motorcycle "Ural". Directly on the handlebar attach the controls from any motorcycle model. 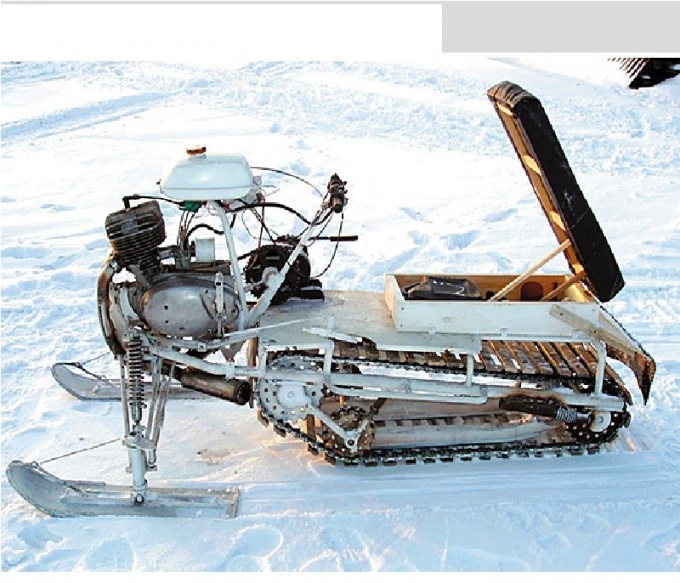 The second part of the snowmobile mount the engine and transmission. They also take from any lightweight bike. As the rear wheel (or wheels) tires, apply low-pressure self-production. They can be made of suitable rims and pneumatic tires cameras. In an inflated condition they are good wheels low pressure. For movement on loose snow binding snegopady located around the circumference of the wheel (wheels). 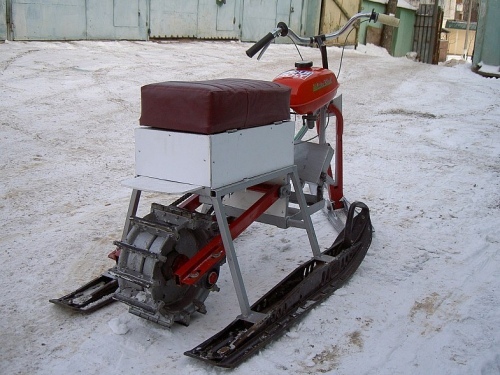 If the design of the snowmobile imply the existence of a rear wheel, the rear suspension will perform on the motorcycle model. Therefore, in addition to the frame weld the rear swingarm and attach it to the frame via a hinge. Using motorcycle shock absorbers, take suspension of the pendulum. Consider and install a chain drive from the engine to the rear wheel. After adjusting the drive and install the rear wheel. If you want to install two rear wheels attach to the rear axle shortened type. For this purpose, find the rear axle of the motor scooter cargo "the Ant" or will shorten the bridge from a passenger car. If you use soft wheels low pressure need to the rear suspension partially disappears. The use of motorcycle shock absorbers technically complicates the task. The use of shock absorbers of the automotive type will not make the suspension soft, as they are designed for much more weight than a snowmobile.